Bellingham Politics and Economics: "How and Why Donald Trump and Republicans will win Whatcom County this Fall." Find your Precinct on myvote.wa.gov and them find your current Precinct Committee Officer or PCO Elect. Email or call them and offer to help them get out the vote: http://www.whatcomdemocrats.com/content/precinct-committee-officers-pcos . Encourage your Democratic friends to register to vote at http://myvote.wa.gov and then make sure they vote. October 10th is your last day to register to vote. Ballots will be mailed starting on October 18th. I suggest you pick an activity of your choice and budget range and simply start working on it. If you call the local Whatcom Democrats ( http://www.whatcomdemocrats.com/content/executive-board-2015-2016) offices, they will have suggestions for you. I joined the Democratic Party after listening to Noel Frame's marvelous speech at the Key Arena Bernie Rally. I wan't to help. But since then I can definitely tell you that running and winning elections isn't a magical process. I haven't met any magicians in the Democratic Party in Whatcom County. And our party has division within it's ranks that mirrors the Bernie/Clinton rivalry. Winning this election won't happen without your help and contributions. Please help!! How and Why Donald Trump and Republicans will win Whatcom County this Fall. 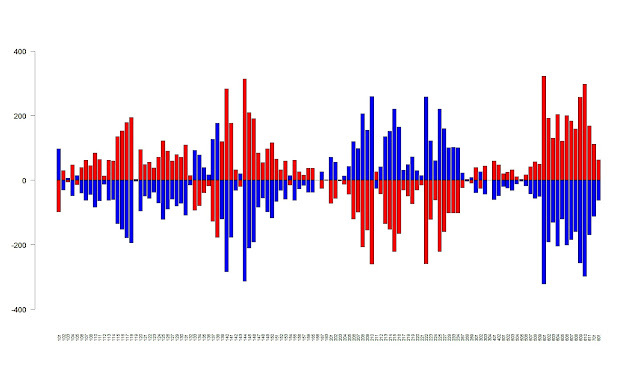 Below the break are a number of charts and data sets on the August 2nd Primary election. I will give you my subjective viewpoint upfront and then walk you through my data below. Currently, there is a wave of publicity denouncing Donald Trump, claiming he is unfit for Presidency complete with polling showing he is losing. I predict Hillary Clinton will lose in Whatcom County and take the rest of the Whatcom County Democratic ballot down with her. Because of the high number of disenchanted Berner youth in King and other WA counties, such a result may pervade much of Western WA. are suffering major trauma and depression from watching the DNC convention in Philly completely trash their generational hopes. Of the two, the second group is probably the most politically damaging. Some people fight through traumatic events and remain committed to their core values. Most of us don't. If there is an accident on one side of the street we change course. If our neighborhood is too dangerous or loud, we move. If the political system seems hopelessly corrupt, we busy ourselves with something else. Revisiting the source of failure and trauma in your life is not an inbred strategy. Most human beings practice avoidance and there is quite a line of thinking that describes withdrawal and avoidance as excellent survival strategies in a brutal world. We may never hear again from many disenchanted Bernie supporters, angry or not. We will note their absence in the voting rolls from their lack of participation. For this group, the constant battle of political conflict now means nothing to them. They will simply just stop voting. Below are the charts and the data that has led me to these sobering conclusions. Editor's Note: Click on all these charts to enlarge. 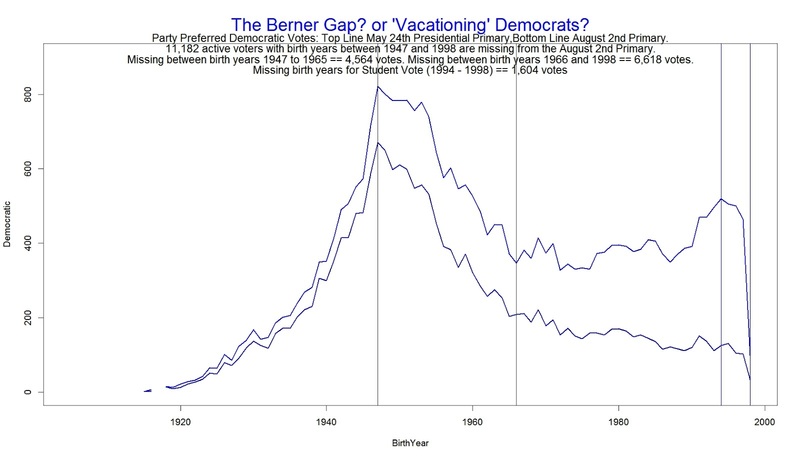 The "Berner Gap" chart. Yes the Republican party preferred had an 8K deficit in the August 2nd Primary over May 24th, but it was much more evenly distributed across age. In the midst of the DNC Convention, the Democrats lost thousands of GenX/Millennial votes in Whatcom County. They also lost a lot of boomer or post war (WWII) votes. The middle vertical line is Birth Year = 1947. (The other vertical lines are 1966,1994 and 1998.) If the Democrats don't get these votes back in the fall, I predict the Republican party will route every single Democratic candidate in Whatcom County. There's a huge potential for college students in Bellingham every school year to turn the fall General Election strongly blue. It never really happens. Given the time and money that has been spent on this, some of us wonder if the efforts have been worth it. Most of you who attend WWU, WCC, BTC are smart enough to figure out that by October 10th you must have updated your address in the voter registration rolls at myvote.wa.gov so you can receive a ballot and vote in the 2016 General Election and any subsequent spring primaries nine months hence. If you move back to your parent's home for the summer, you update your residence address again at myvote.wa.gov for the summer. All those high SAT scores, all that hard work in high school, all that computational power some of us never had when we were young, all that internet access... All of you are bright enough and old enough to have seen the chaos of the world around you. You should understand that the absence of your participation won't save you. You must know by now that the generations in front of you have no clue, otherwise the world wouldn't be such a damned mess. You must know by now that if you don't start shaping your future, your future will be shaped by someone else. So what is keeping you from voting? Maybe to those that are young now, the entire world looks as hostile and confused as the Democrat Convention in Philly. 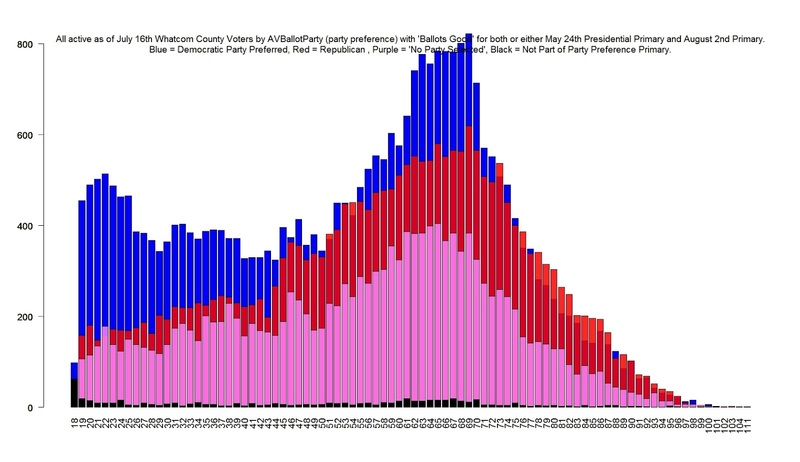 The chart below shows us the 'matchback' field AVBallotParty ('party preferred') by Age applied to those who voted in one of or both of the May 24th (54K good ballots) and August 2nd (49K good ballots) primaries. This chart represents about 70K unique voters, a number that may well define a good lower constraint for turnout in the November election in Whatcom County. 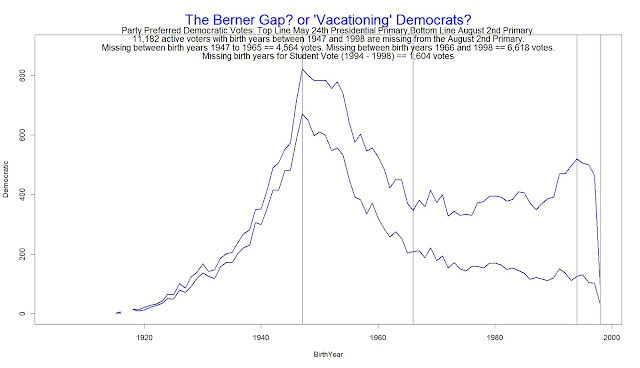 We can see here that those voting as party preferred Democrats outflank Republicans in a number of Birth Years that include millennial, GENx and post war generations. The pink/light purple is "No Party Selected" or a black box however, it mimics a Republican birthyear shape. If the General Election were run tomorrow with all these voters showing up at the polls, Democrats would stand a strong chance of winning many races. If those "tall blue bumps" decide throw their mail-in ballot in the recycle bin this fall, bad news will follow for the Democratic Party in Whatcom County. The next chart compares those that voted in the May24th PP and August 2nd Primary (~70K) with those that are registered and active as of July 16th (~132K). The remaining 51K is decidedly younger and may not all be relied upon to vote if (indeed) all those registrations are real. 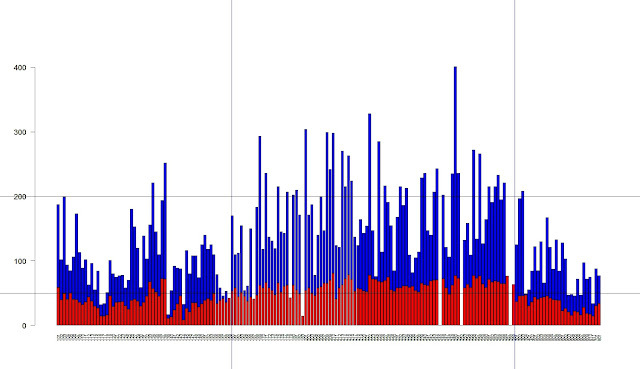 Unique active voters for the 2015 GE, May 24th PP and August 2nd Primary total about ~83K as of July 16th. That may be an excellent upper constraint number for the fall election. Dragging more Democratic voters out of that 51K not participating in either of the last two primaries will be a critically important but problematic effort. 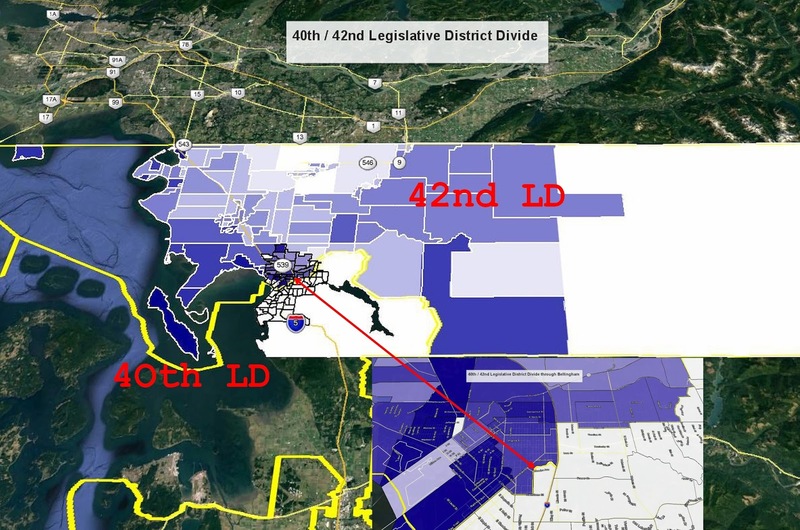 Before I start talking about the importance of votes in 42nd LD, lets take a look at some Legislative District maps. You might want to skip this part if you are a politico. I suggest not, since this map is color shaded from light to dark by the number of votes Sharlaine LaClair received in the Primary (13,042) total. All these areas need to get darker if Democrats Sharlaine LaClair and Tracy Atwood (10,807) will catch Republicans Luanne VanWerven (16,800) and Vincent Buys (17,343). The next charts below gives us Patty Murray's vote total (blue) and her percentage (red) of ballots cast per Whatcom County's 178 Precincts. Murray ran the strongest of all the Democratic candidates in the August 2nd primary winning in both the smaller 40th LD (~42K registrants) and the larger 42nd (~90K registrants). However, had Patty Murray been running against 42nd LD Representative Vincent Buys in the 42nd, she would have lost by over 3K votes. Notice how the 42nd LD Democrat candidates (LaClair and Atwood ) are trailing their Republican candidates by 4K and 6K respectively. The rectangular area in middle of the graph represents the Democratic wheelhouse: South Bellingham/Chuckanut unincorporated county stretching right into the entire 200 series of Bellingham proper. 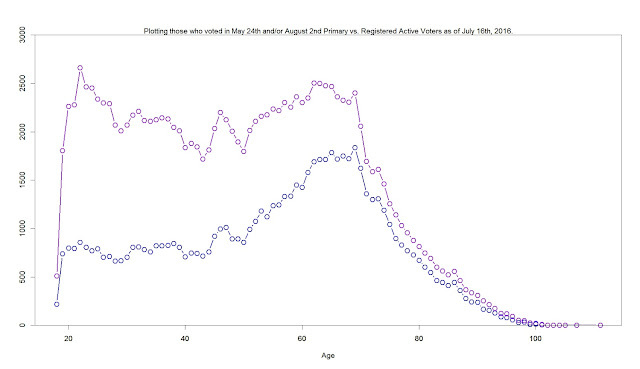 Almost everyone of those precincts had 50% more of their August 2nd Primary vote for Patty Murray in this graph. But let's take a deeper look at the other precincts not so blue now. The graph below subtracts Murray's vote from Buys for all 120 LD 42 precincts then sorts those votes by volume. 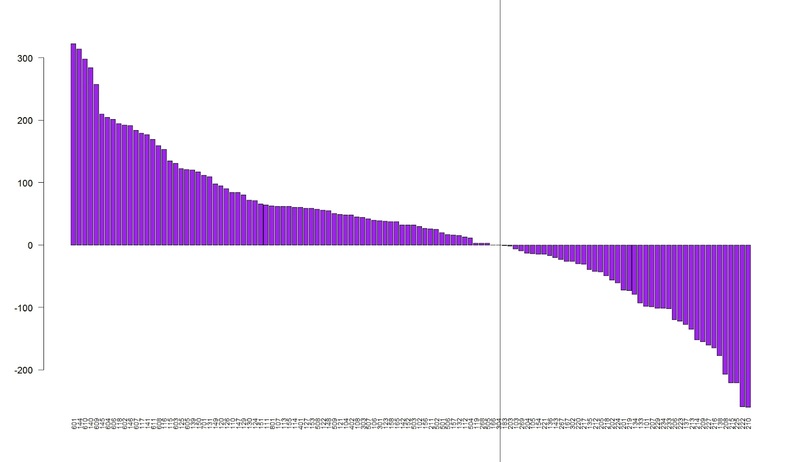 Those positive bars are the 71 precincts in LD 42 that created more votes for Vincent Buys than Patty Murray. The net difference is ~3K votes is distributed in a roughly 7:4 ratio. Murray and Buys are probably excellent vote proxies for Clinton vs. Trump and I expect that 7:4 ratio will probably be applied in the 42nd LD for this fall's race for the President. Left of the vertical line gives us LD 42 Precincts that voted more for Vincent Buys than Patty Murray. The precincts on the far right should get special attention from the Democratic Party. It is almost impossible to predict electoral futures. Your discussion of your prediction can change votes. Maybe if you are a disgusted or depressed Berner, you will read this article and think carefully about how not voting at all would cast those 'down ballot' Democrats out of political contention. Maybe if you are a Clinton supporter, you realize that you are living in a comfortable bubble of your own creation, not understanding how much you need Berners to prevent the Trump/Buys/VanWerven Train from running your county and neighborhood for the next eight years. Maybe if you are a resourced South Chuckanut retiree, feeling secure in your perpetually liberal 40th LD statehouse reps, you see that the world of liberalism is shrinking around you step by step (See 1,2,3). That it is only a matter of time before an ALEC sponsored Senator Buys ousts Cantwell or Murray from their long held positions amid a shrinking Democrat statehouse in Olympia. Maybe all of you will decide to do something about these possible outcomes. Or maybe not. I know the following from watching the both Berners and Clinton supporters and trying in vain to split the difference between them without getting attacked by either: Neither side is really talking to one another in a constructive manner. Both sides are focused inside their own smoke stacks on realities they claim as their own, not really willing to acknowledge the pain and viewpoint of the other. Despite what you read, the Democratic party is far more split than the Republican Party and this year the DNC has really trashed the hopes of its burgeoning youth voters. The last time they did this was election of 1968 and the country received six years of Richard Nixon, a moderate Republican with some nasty views about students, minorities and Democrats. I don't remember the election of 1968 because I was six then, but I remember the political events of 1969 - 1974 very clearly. Those events made a striking impression upon me as a child growing up in east Oakland. Some of you might remember the events of those years too. The nation's college age youth ('boomers') were in a very sour mood. Years of an un-winnable, brutal war in SE Asia, the assassinations of RFK and MLK and the ascendancy of Richard Nixon and Henry Kissinger turned activists into extremists. The Democratic process had become less useful to many. They had names these events: The Vietnam War, The Viet Cong, The Student Democratic Council, The Black Panther Party, The Weather Underground, The Secret Bombing of Laos and Cambodia, Watergate (many names here), The Plumbers, The Tapes, The Special Prosecutor, The Symbionese Liberation Army, The Death of Marcus Foster, The Kidnapping of Patty Hearst. It might be difficult now for youth to understand this period. I found reading the wikipedia entry on DCI Richard Helms a good introduction. It really wasn't a happy time for the country as a whole. Watergate itself was a shocking development and had to be explained to all of us 12 year olds who were watching the after school hearings of Judge John Sirica grilling President Nixon's staff on television. Donald Trump strikes me as a Nixon/Wallace hybrid. Trump's campaign appeals to the same white working class and poor white audience. This significant electoral pool has helped put Nixon/Ford, Ronald Reagan, Bush/Qualye and Bush/Cheney in power for 28 of the last 48 years. This pool of voters is usually conveniently dismissed by both the liberal and business classes in American today. But electorally, the "Catholic Conservatives", "The Solid South", "The Silent Majority", "Joe Six Pack", the "Trump Train" or whatever incantation we choose to label them with today, this group has always swung elections because of their sheer electoral power. Their votes won't be easily dismissed in 2016. We always bleed over our Presidential losses as Democrats, don't we? Humphrey, McGovern, Mondale, Dukakis, Gore, Kerry... Did I leave anyone out? There are a lot of votes in Whatcom County. In the 2015 GE, we outvoted three counties larger than us (Yakima, Kitsap and Thurston). Many of these voters are Democrats and many of these Democrats felt completely engaged by Bernie Sanders. Those same Democrats feel now like they are facing a headless giant that just pissed all over them. If the Democratic party wants those votes back, they are going to need something more palpable than just the denigration of Donald Trump.